Over 100 people whose lives have been affected by cancer have been learning about the local support available to them at an ‘invaluable’ event in Southport. The health and wellbeing event was organised by the Southport Macmillan Cancer Information and Support Centre in conjunction with NHS Southport and Formby Clinical Commissioning Group (CCG) and Southport and Ormskirk Hospital NHS Trust, held at the Royal Clifton Hotel and provided an afternoon of information for local people. Hannah Bland from Sefton Council for Voluntary Service (CVS) was a guest speaker talking about the role of ‘community connectors’. These volunteers work to reduce social isolation by supporting people to access local groups and organisations and help them to become more involved in their local community. Those attending the health and wellbeing event said they benefited from hearing from other people affected by cancer and sharing ideas, as well as the two breakout sessions on ‘the fear of recurrence’ and ‘the importance of self-management’, which were led by local healthcare professionals. The range of support available locally for people was displayed on more than 30 market place stalls that people were invited to browse. Stallholders ranged from the clinical nurse specialists from Southport and Ormskirk NHS Trust and Aintree Hospital NHS Trust, to support groups, voluntary organisations and other services that can help people live with and beyond cancer. Going beyond physical health, visitors were treated to a mini-makeover provided by Boots No7 or a hand massage courtesy of Sefton OPERA. Taking time to care for your mental wellbeing is just as important as physical treatment. One of those patients who attended the event said: “Whether it’s your first time of going or your third, you always get to hear new information and help which can only be a good thing. “These events are invaluable as you can speak to specialists and ask questions which you may have forgotten to ask a doctor or consultant. 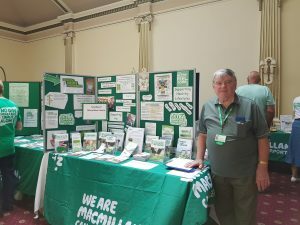 Graeme Allan, primary care cancer lead and Macmillan GP at NHS Southport and Formby CCG, said: “It’s great to see so many people coming to find out about the local services available to them. “Cancer touches so many people’s lives and it’s important that we support people as they go through treatment, or are caring for someone else who is. The next health and wellbeing event promises to be even better as the focus of the afternoon will be all about living life and having fun. The staff at the centre will be combining this event with the Christmas fair so there will be plenty to see and do. More details will be released later in the year.